Nick Foles will be the man in Philly for at least one more week. What is the line telling you: This is a tricky week, because in the final week of the season, it’s bizarro world, because you don’t know who is going to play a full game and who’s not. Just some advice to the guys out there, don’t go crazy betting these games this week, because you have a lot of times to bet during the playoffs and Super Bowl. Oddsmakers and offshore opened this line with the Eagles being huge 7-point favorites with the total set at 42. The early market reports are showing the Eagles are receiving 80 percent of all tickets placed. The betting public loves the Eagles and Nick Foles in this spot coming off of the huge win over the Texans. But the reality is the wise guys took a huge bite on Washington minus-7, but the number is inflated. The Redskins have enough on offense to stay within the Vegas spread. 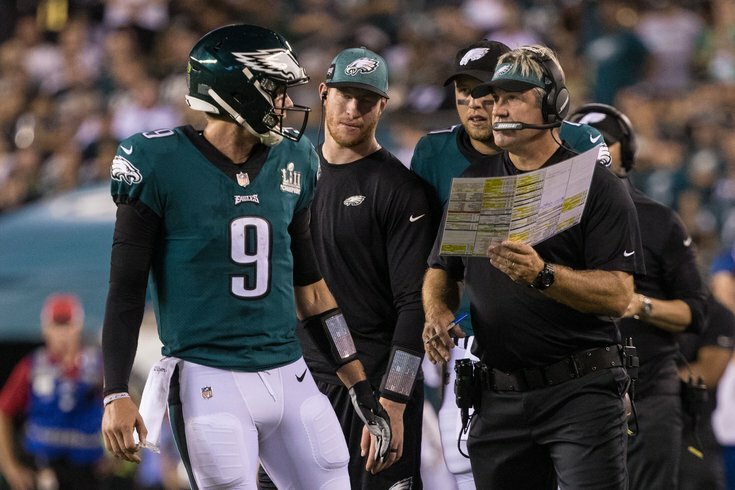 The bookmakers know everyone will be jumping on the red-hot Eagles this week in a must-win situation, so you better believe that you will be paying much more to back them. The Eagles will still win. But the line is too high. Overpaying in any market is never a good idea. If you want to bet the Eagles, a suggestion is to tie them into a teaser with the over. Bottom line: The smart money likes Washington. What is the line telling you: Oddsmakers opened this line in Vegas with the home team Vikings playing for their playoff-lives as 4-point favorites with the total set at 41.5. We’ve seen this line hit Minnesota minus-6, but when Chicago coach Matt Nagy said he would be playing all of his guys, that shot back down to Vikings minus-4.5. Be careful betting this game, because if the Los Angeles Rams are blowing out the San Francisco 49ers by halftime, Nagy may decide to limit the playing time of key players in the second half. What the sharp money decided to do was go under 21 for the first half of this game, considering both teams have a lot to play for. They may play conservative early, looking to limit turnovers. The Bears are definitely the right side, if motivation exists on both sides of the ball in the second half. If the Rams-49ers are close, the Bears will go out all out. Bottom line: The smart money likes the under & under-21 in the first half. What is the line telling you: Bookmakers in Las Vegas cracked this opening number with the surging 9-6 Colts as 2.5-point road chalk against the Titans with the total set at 44. Since then, we've seen wave after wave of sharp money start to nibble on the team with the best point differential in the AFC South, the Colts, which forced the books to adjust their price anywhere from a half point, up to a full point through that key number of three on Andrew Luck’s squad. The total saw a small penetration of sharp money enter the market and hit the screen on the under as well. As of right now off shore, Pinnacle sports book is offering you the Colts at minus-3, minus-120, while the West Gate Super Book in Sin City has punched this game up to 3.5 even money. The total is painted 43 from coast to coast and across your sports betting screen. Talking off shore and in Vegas, the news is all the same, Indianapolis is garnering right around 75 percent of all tickets punched along with almost 85 percent of all the money wagered. So, there's a ton of square and sharp money burying the Colts in the early soft market. In this type of spot, you would usually be looking to take the home team catching three against a divisional opponent, but when you break down this game on the offensive side of the ball, the Colts rank 14 spots higher than Tennessee in yards-per-play, and over the last three games, the Colts are averaging the fourth-most yards per play in the NFL. When it comes to yards-per-pass attempt both teams average the same exact 6.9 yards, but over recent play the Colts are averaging almost a full two yards more per pass attempt. On the defensive side of the ball both teams are extremely stingy. The Titans are allowing opponents only 5.3 yards per play, while the Colts come in at 5.4. An extremely important stat come December and playoff time is opponent yards per rushing attempt, and in this metric, surprisingly, the Colts rank six spots better than the Titans and allow a half yard less per rushing attempt. When we look in the trenches, Tennessee and Indianapolis defensive lines lack a great pass rush as both squads rank in the basement of the NFL in adjusted sack rate, definitely benefits the team with the better quarterback, and that’s Luck. The Colts have the third-best pass protection in the NFL this year, giving up the least amount of sacks on the season (17), while the Titans come in ranked 31st in that metric, giving up 48 sacks on the season. Bottom line: The smart money likes the Colts, double dipping on the money line.